The Pittsburgh Steelers had gone through a disappointing 6-8 season in 1961. One of the problems had been the health of QB Bobby Layne, an all-time great and an outstanding leader but increasingly brittle. Head Coach Buddy Parker had expressed the desire to pick up another top quarterback and, on April 4, 1962, he did so. Ed Brown was obtained from the Bears for a 1963 first-round pick and an unspecified player to be named. In a separate deal with Chicago, punter Bobby Joe Green was dealt to the Bears. The draft choice was used to take Dave Behrman, a center from Michigan State, who signed with Buffalo of the AFL. Brown, at 33, had played seven seasons in the NFL and was 6’2” and 210 pounds. A proven quarterback, he was also a punter. Taken by the Bears in the sixth round of the 1952 NFL draft out of the University of San Francisco, where he had been part of the legendary undefeated team of 1951, he spent two years in the military before joining the club in 1954 and took over the starting job in ’55. He went to the Pro Bowl that year and again in 1956, when he also led the league in passing and the Bears topped the Western Conference. While his passing efficiency failed to remain at a high level (his completion percentage was under fifty percent in four of the next five seasons after his league-leading 57.1 in ’56), he had a strong arm and was considered among the best long passers in the NFL. 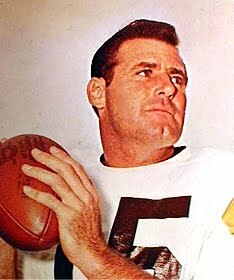 Often splitting time with other quarterbacks (first George Blanda and then Zeke Bratkowski), Brown had lost his starting job to Bill Wade in 1961, a veteran obtained from the Rams. It was Layne behind center for the most part during the ’62 season and the Steelers, after starting slowly, went 9-5 to finish second in the Eastern Conference. Brown started three games and threw a total of 84 passes, completing 43 for 726 yards and five touchdowns with six interceptions. He handled the punting, averaging an even 40 yards on his 60 kicks. Layne retired following the season and Brown took over as the starting quarterback in 1963. For the most part, he had a fine season for a Steelers team that contended until the final week. He achieved career highs in pass attempts (362), completions (168), yards (2982), and touchdowns (21) while also tossing 20 interceptions. His 17.8 yards per completion led the league. Along the way, he had a 377-yard, four-TD performance against the Cowboys and made the most of having a capable deep threat in Pro Bowl split end Buddy Dial (60 catches, 1295 yards, 21.6 yards per catch, 9 TDs). However, while three ties allowed Pittsburgh to mathematically remain in contention (ties did not factor into the winning percentage as they do today), in the final-game showdown against the Giants in New York, Brown had a dreadful day. He was off target all day and was successful on just 13 of 33 throws for 217 yards with two touchdowns but also three interceptions. The 33-17 loss dropped the Steelers all the way to fourth place at 7-4-3. In the offseason, Dial was traded to Dallas, a much-criticized move that was made all the worse when DT Scott Appleton, the highly-touted rookie from Texas whose rights they had obtained for Dial, instead signed with the Houston Oilers of the AFL. While third-year flanker Gary Ballman rose to the occasion, the rest of the receiving corps did not, and Brown’s numbers suffered accordingly. He completed just 44.5 percent of his passes for 1990 yards and threw far more interceptions (19) than TD passes (12). The Steelers finished next-to-last in the Eastern Conference with a 5-9 record. Coach Parker abruptly quit during the 1965 preseason, to be succeeded by Mike Nixon, and the club dropped all the way to the bottom at 2-12. Brown was shunted aside in favor of young quarterbacks Bill Nelsen, who was up-and-coming, and Tommy Wade, who was not. He threw just 18 passes – five of them interceptions – and finished out the season (and his career) with the quarterback-depleted Baltimore Colts. In his four years in Pittsburgh, Brown completed 339 of 736 passes (46.1 %) for 5821 yards and 38 touchdowns along with 50 interceptions. He also punted 148 times for a 40.6-yard average. Having filled in capably for Layne in 1962 and nearly led the club to the Eastern Conference title in ’63, he came up short in his most significant game with the Steelers and his performance dropped off quickly thereafter.